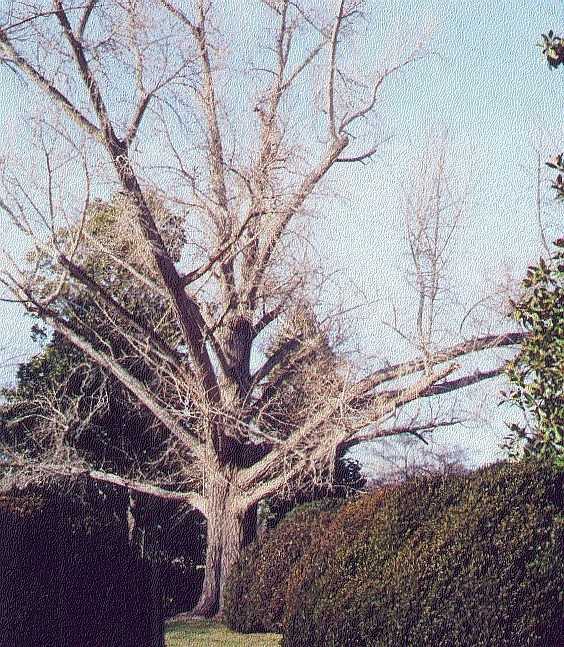 "The owners of the White Marsh Plantation Ginkgo in Virginia have no exact idea how old the tree is. They say the tree has lost many big branches to storm damage over the last 50 years. They know a person who had been in Korea for a number of years. This person says that the White Marsh Plantation Ginkgo is bigger than 1000 year old trees in Korea so it also must predate Columbus coming to America. This person believes White Marsh Plantation Ginkgo to be a geological freak of nature and must be a relic that has some how managed to survive in Virginia USA from the dinosaur age. However, the owners believe the legend that the early White Marsh Plantation owner knew a ship captain and asked him to bring back samples of plants from around the world that would survive in Virginia’s climate. The owners also believe that due to the warmer climate here and due to the deep roots finding favorable geology beneath White Marsh Plantation, their Ginkgo tree has grown quickly to its large size. The White Marsh Plantation Ginkgo is now recognized as the Virginia USA Champion. It is an immense tree and I am glad I had a chance to measure the tree for the state record book. Who would believe that a tree that grows so slow could get so big! The tree’s February 2001 dimensions are: height 26.2 m (86 ft), trunk circumference 4.83 m (190 in), average crown diameter 29 m (95 ft). This gives the tree 300 points. This tree was planted approximately in 1820 and the current owners are taking good care of this fine specimen."